Creamy, crispy, and delicious! 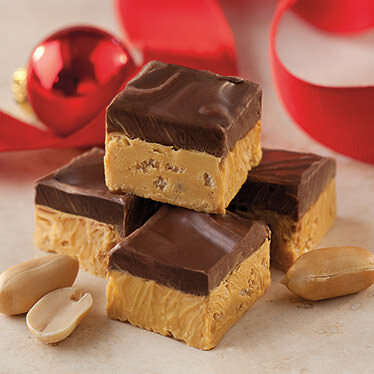 Our soft peanut butter candy is blended with crisped rice and topped with a rich chocolate frosting then cut into bite-sized pieces. Arrives in a red and gold striped gift box. INGREDIENTS: yellow pastel coating (sugar, partially hydrogenated palm kernel oil, whey, nonfat milk, mono and diglyceride, soy lecithin, natural and artificial flavors, yellow 5 lake), homogenized creamy peanut butter [salted peanuts, sugar, hydrogenated vegetable oil (rapeseed, cottonseed & soybean), salt], crispy rice [rice, sugar, salt, malt flavoring, vitamins and minerals: sodium ascorbate (vitamin C) reduced iron, alpha tocopherol acetate (vitamin E), niacinamide, vitamin A, palmitrate, pyridoxine hydrochloride (vitamin B6), thiamin mononitrate (vitamin B1), riboflavin (vitamin B2), folic acid, vitamin D, vitamin B12], milk chocolate (sugar, chocolate liquor, milk, cocoa butter), soy lecithin, vanillin: an artificial flavor). ALLERGEN INFORMATION: Contains milk, soy and peanuts. This product manufactured on equipment used for processing tree nuts, wheat, and seeds. Recommended Storage Conditions: Once opened, tightly wrap box in plastic and store at room temperature for up to two weeks. Yuck, didn't like at all as they have no creaminess, just a hard crunch that did nothing for the taste. Sorry I bought them, was expected a creamy treat. 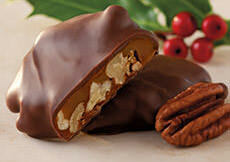 Just the right size, the right amount of sweetness and a little bit of crunch. I will buy again! 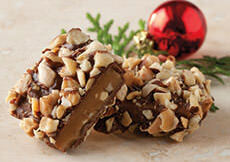 This product is excellent I wish t wasn't seasonal.Just the right amount of peanut butter and chocolate. Ordered this for someone for Christmas. They replied by saying that this candy was "to die for", so it was a big hit! I then ordered some for my family, and I agree. It is creamy and delicious.